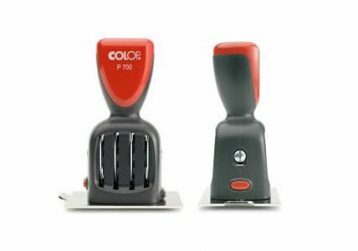 Self-inking and traditional date stamps are available in a variety of shapes and styles which can be customized individually with your graphics, logos and text. These include heavy duty professional daters that will stand up to the roughest treatment. Date stamps include a minimum of ten years, to a maximum of twelve, on the date bands and the date size, unless otherwise noted, is 4 mm in height. 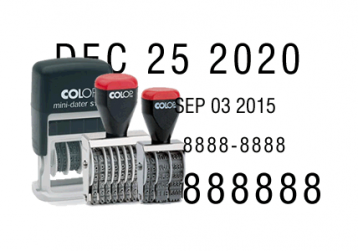 All our self-inking date stamps feature covers over the date bands – no more inky fingers! 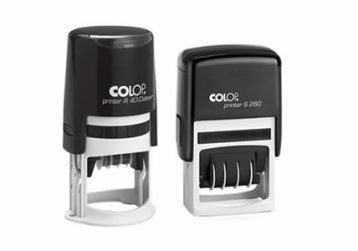 Replaceable ink pads and text plates ensure your stamp will last a lifetime. Environmentally and economically friendly. 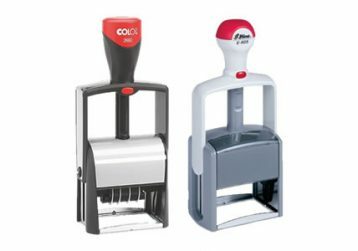 Let us know what type of stamp you would like.